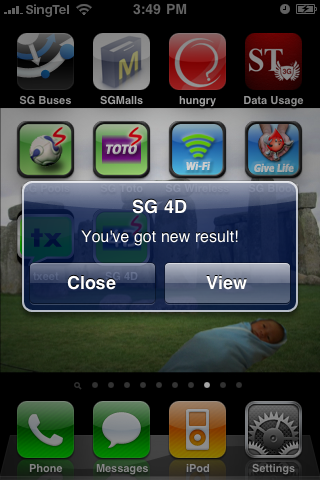 A new version of SG 4D has been released for iPhone. In this new version, users can receive push notification when new 4D result is available! Yea.. and if you noticed, the screenshot above is taken with an iPhone running OS 4.0 (custom wallpaper!). 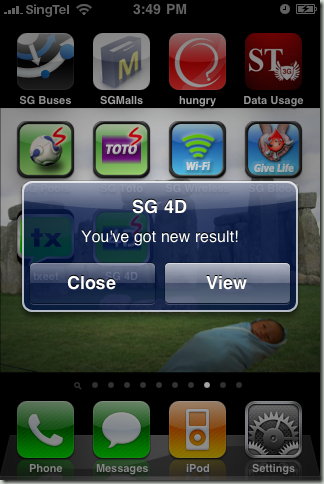 So if you want to be alerted as soon as new 4D results are available, download SG 4D now. Disclaimer: Push Notification is only available when you unlock the premium features ($3.99). ← What’s technically new for SG 4D?